The Marci possesses a slim, sculptural silhouette delicately balanced on brass feet. A perfect addition to any living space. Shown here: in ebonised walnut and solid brass. This piece is made from solid and veneered timber and is available in various finishes. Each Stuart Scott piece is built by hand in our workshop in Wiltshire, England. Nothing is mass-produced. This ensures complete attention to detail, structural integrity and sheer build quality. We never compromise. When we finish each piece, it is signed and numbered: a unique handmade masterpiece. Registered Design No. 6039802. Customers can choose from the following timber finishes: Oak - Oiled, Aged, or Ebonised. Walnut - Oiled, Ebonised, or Black Lacquered. Brass: natural or *bronzed Bronzed brass carries an upcharge of £120 per table. 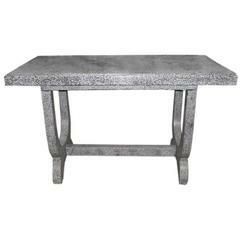 Contemporary black and white granito console table.